← Object With Several Yellow Lights Chased by Large Airplanes. Several Photos Taken of Unusual Objects in Poplar, MT. 4 PHOTO COLLAGE PREPARED BY WITNESS. 6 PHOTO COLLAGE PREPARED BY WITNESS. All but one of these objects were shot from my yard. I was usually walking my dog. 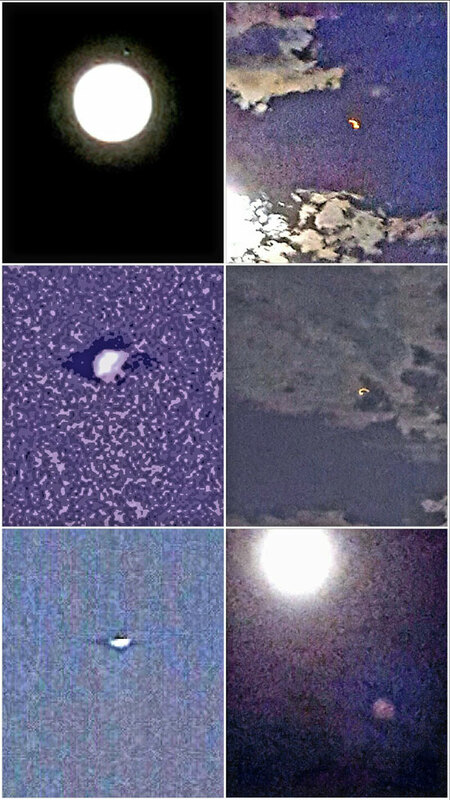 The first object was the large Orb in the lower right of the 4 photo collage. It was below zero that night and that object was moving westward at less than 50 MPH and stopped above the local hotel about 500 feet above for 30 seconds when I got the photo. It left right after that photo was taken. The next objects were a small cluster of objects going past the moon. I took a photo of one of those objects. The photo can be found in the upper left photo in the six photo collage. 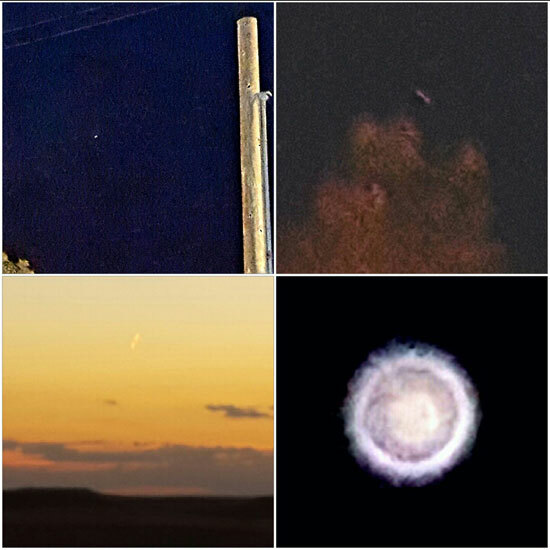 The same night I saw the lower right object of the six photos. This object was descending towards the south. I lost it behind the hillside and never saw it again. This craft was silent approaching and leaving. Came from SW, left NE then North. It is the bottom left photo of six first then the middle left photo of six. The Snake. That’s what I called it. It continually moved in a snake-like fashion. Changing shapes as it moved. The first photo is the middle right of six, the second photo was upper right a few seconds later. The object went above the cloud cover. This object looks like a pair of lights that I caught leaving area in an ascent. I can’t really say much about it. It was leaving fast and heading into orbit. It is the upper left of the 4 photo collage. This is a large object that I estimated to be 300 to 500 feet in length. I never heard anything. I just saw the dog barking at it. It moved eastward at 100 MPH plus. It was probably 3,000 to 4,000 ft above the ground. It is the upper right photo of the 4 photo collage. I have no idea what this object was. I watched it hover for 30 minutes heading home. The clouds finally blocked my view. It never moved, but made the sunlight reflect a lot off of it. It was very bright. It is the lower left photo of the 4 photo collage. I too take this very seriously. I have no desire to be hassled by “investigators” about this. But God as my witness these objects all appeared while walking the dog, except the last one was in the truck, who by the way barked at each one as though he knew they were there as well. Maybe the objects were making sounds that we don’t hear? I don’t know. I’m a retired machinist by trade and not a UFO hunter. This is what it is. I am just looking for answers. Note: It is difficult to investigate each of these sightings in detail. The photos, by themselves, don’t appear unusual. However, when you consider what the witness observed the photos speak “volumes.” The witness did a good job of documenting each photo and gave a good synopsis of what he saw each time. This entry was posted in Montana UFO Sightings 2016, Montana UFO Sightings Before 2016, UFO Photos Montana. Bookmark the permalink.